- Guide And Tour Of The Castle, Gardens And Estate. Ballindalloch Castle, in the heart of Speyside, is affectionally known as the Pearl of the North due to its well preserved beauty. 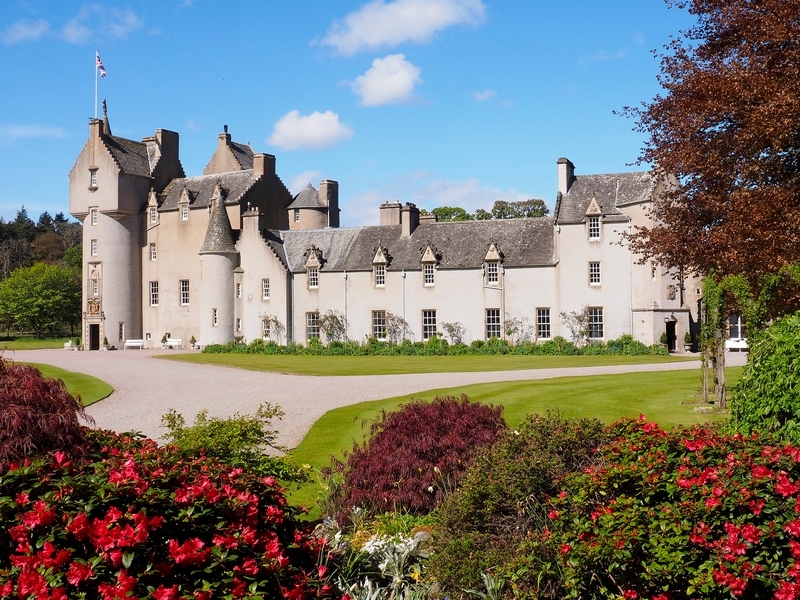 Located amongst some stunning hills and with the nearby Rivers Spey and Avon, a visit to the Castle and its grounds and gardens makes this an ideal day out. You really should allow at least 4 hours to visit the estate. Ballindalloch Castle has been home to the Macpherson-Grant family since 1546 and they still own the Castle. Building work on the Castle is thought to have begun in 1546 with construction of a traditionally Z plan building. The following Centuries saw extensions to the original tower house building. Further repair work was undertaken following the Battle of Inverlochy in 1645 after the Castle was plundered and burned by the Marquis of Montrose. Two further wings were added in 1770 by General James Grant. A formal courtyard was added in 1850 and the entrance to the Castle was moved to the East Tower. Nine more bedrooms were added in 1878 by Sir George Macpherson-Grant, though these were demolished in 1965 during restoration work. There is no set tour times, nor a guide - you follow a pre determined route around the Castle rooms. Each room has wooden information sheets to read that explains the function of the room and key points. The Castle is filled with family memorabilia and collections. Points of interest include the grand staircase of The Hall with its unusual umbrella design and fan vaulting, a collection of 18th Century china and a display of Scottish dirks. The Castle Library has a fine collection of volumes which is reputed to be the best amongst country houses in Scotland. The Great Hall is now used as the Dining Room and in 1850 the room was redesigned and panelled in American pine. The collection of silver cups was won by Sir George Macpherson-Grant for his world famous Aberdeen Angus cattle. There used to be another Ballindalloch Castle in Scotland and it is now a mansion house located one mile west of Balfron in Stirlingshire. It belonged to the Cunninghams of Glencairn then passed to the Dunmore family by the 18th century and then to the Coopers in the 19th century. (cited in Castles of the Clans: The Strongholds and Seats of 750 Scottish Families and Clans by Martin Coventry). There have been several ghosts sighted at Ballindalloch Castle. These include a green lady and a pink lady in the dining room. General James Grant, who died in 1806, is said to still ride around the lands, inspecting his beloved Castle. After he has done this, his spirit heads to the wine cellar! Just outside the Castle entrance is a bonnie rock garden with a wee spring running through it. The walled garden is a relaxing highlight of the visit. By the large car park is an area for dogs to be walked. The Aberdeen Angus of Ballindalloch cattle herd are the oldest herd in the world. You can walk past them grazing near the River Spey. Venture further down to the river for some stunning views and hear the tranquil slow tumble of the River. There are some benches for picnics. Admission Free. The Bull Will Charge You Later! The Castle Shop sells a range of Scottish crafts, books and gifts, including the book, I Love Food by Clare Macpherson-Grant Russell. View more details about the recipe book. The shop has a cafe which sells a delicious range of cakes, snacks and drinks. Located beside the shop is an auditorium which pre plays a video about the Castle, grounds, gardens and estate. The Castle has a 9 and 18 hole golf course and other estate country sports include fishing and shooting. From Aberdeen take the A96 to Keith, then follow the A95.